Father Rickey Valleroy talked with Veneita Carron on the steps of a one-room schoolhouse museum next to St. Lawrence Church in Lawrenceton. Father Valleroy recently became the pastor of St. Lawrence in Lawrenceton and St. Agnes in Bloomsdale after recovering from health issues. Near the end of July and in early August, Father Rickey Valleroy joined his new parish family for a couple of landmark events in the life of St. Lawrence Parish in Lawrenceton, about 60 miles south of St. Louis on I-55. On July 22, he kibitzed, visited and otherwise mingled at the parish picnic, the annual extravaganza that drew about 1,700 people into the dining hall for a fried chicken and liver dumpling dinner. Then, on Aug. 5, he concelebrated Mass with Auxiliary Bishop Mark S. Rivituso to mark the 100th anniversary of the church building, which the parish rebuilt in 13 months after it was destroyed by a tornado on May 30, 1917. Nothing was unusual about any of this, just Father Rickey being his engaging, gregarious, fun-loving self. But there were subtle signs of his life-threatening health issues from a year ago: balancing himself by slightly leaning against the altar while free-standing in the anniversary Mass; sitting to chat with parishioners rather than working the room; being a tad more reserved than in the past. 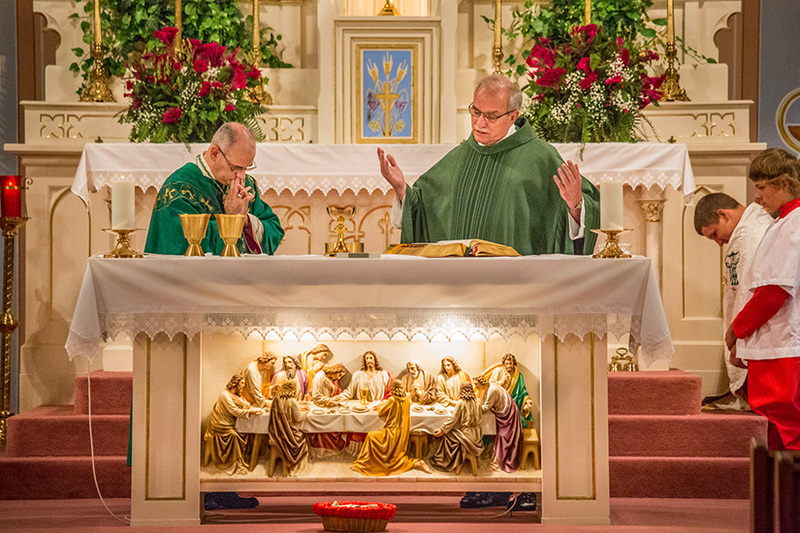 Father Rickey Valleroy celebrated Mass with Auxiliary Bishop Mark Rivituso at St. Lawrence in Lawrenceton on Aug. 5 on the 100th anniversary of the church building. Just minor subtleties compared to the major health scares of late summer 2017: a blocked femoral artery in his left leg, a brain aneurysm and two strokes over nine days — Aug. 24 to Sept. 2. Father Rickey, 60, sees God’s hand in these medical setbacks. “When I look back at it all, I think God gave me a six-month sabbatical because God knew I wouldn’t do it myself,” Father Rickey said after Mass on Aug. 5. Father Rickey was out of commission from early May until returning in mid-October to his former parishes — St. Joseph in Farmington and St. Catherine of Alexandria in Coffman. (He since has been reassigned to St. Agnes in Bloomsdale and St. Lawrence in Lawrenceton.) Extreme difficulty and pain for Mother’s Day Mass at St. Catherine started his medical odyssey, which was the culmination of a long decline in health. For about three years, he had been struggling to celebrate Mass, with symptoms — pain in his hip and leg and dizziness — growing progressively worse. He specifically had trouble raising the host, the chalice and then the paten and chalice in combination during the Eucharistic prayer. By the end, he estimates that he was raising them only a couple of inches above the altar top. This is the high point of the Mass — the transubstantiation of hosts and wine into the True Presence of Jesus Christ’s Body and Blood — and prompted multiple doctors to theorize that a priest feeling pain and wooziness at this point of the Mass had to be suffering from clinical anxiety. Surgery to repair the aneurysm was delayed so doctors could figure out what was causing his troubles at Mass. They diagnosed the blocked artery, then fixed it on Aug. 1. The procedure to repair the aneurysm came next, on Aug. 24, but he suffered a stroke on the operating table during the procedure to snake coils through his veins to the aneurysm site. After a week-long stay in intensive care, he went to his family’s farm near Perryville to recover. But on his third day there, with his twin brother, Randy, caring for him, he suffered the second stroke, which initially disrupted his speech and ability to walk. After that stroke, he spent time recovering at Archbishop Robert J. Carlson’s residence to be near the hospital in case of yet another stroke. He described the stay there as a “blessing.” He got to recover with a bishop staying there recovering from heart surgery, and the Religious Sisters of Mercy of Alma caring for them happened to be a medical doctor and a nurse. After the stay in St. Louis, he returned for more recovery at the farm, where he witnessed the beauty of God’s creation in action — crops growing and being harvested, insects flitting about and animals scampering to and from the woods. He expresses gratitude for family, friends, high school classmates and parishioners who stayed with him or visited, plus his physical therapist, Archbishop Carlson, Vicar for Priests Father Michael Boehm, the RSM sisters and countless others who prayed for him. In other words, he counts his medical issues as a blessing, giving him deeper insight in his ministry to people suffering and in pain, whether physical, mental or spiritual. The hardest part of the ordeal, he said, was an encounter with depression, which he had never experienced previously, but gave him a new-found empathy in his pastoral ministry. After 13 years in Farmington, he requested a smaller parish and was assigned to St. Agnes/St. Lawrence, which allows him to complete the final year in his term as dean of the the Ste. Genevieve Deanery. He’s also less than 30 minutes from family and the farm, an easy commute on I-55 as he fully recovers. Although Father Rickey worried at one time about being able to continue as a priest, he figures he’s about 95 percent recovered and is thankful to be able to keep answering his calling.